Hunter Hammersen picked up the needles in 2001 and taught herself to knit and purl. After an ambitious start that didn’t quite work out, she put down the needles for a while. Eventally she came back to knitting with a pair of socks and she has been going strong since! The colors of the yarns used are faithful to the botanical prints and the yarns used are from many independent dyers. Hunter is a big fan of the slightly heavier “fat sock yarns” that are often found in a merino-cashmere-nylon blend. 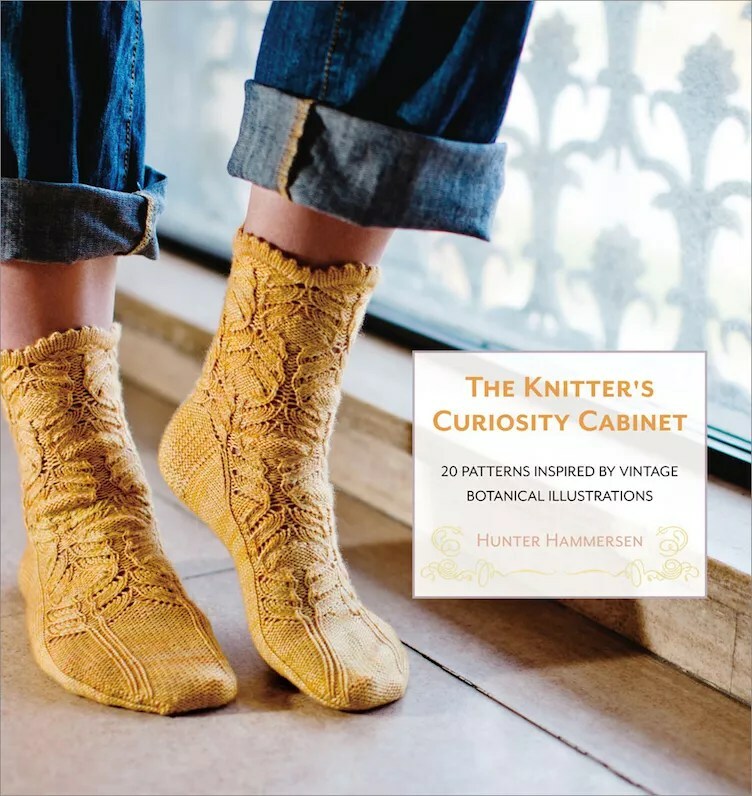 You know the drill – please leave a comment on this post for a chance to win a copy of The Knitter’s Curiosity Cabinet! Answer Marly’s question and include Hunter’s keyword! A winner will be drawn in 2-3 weeks! 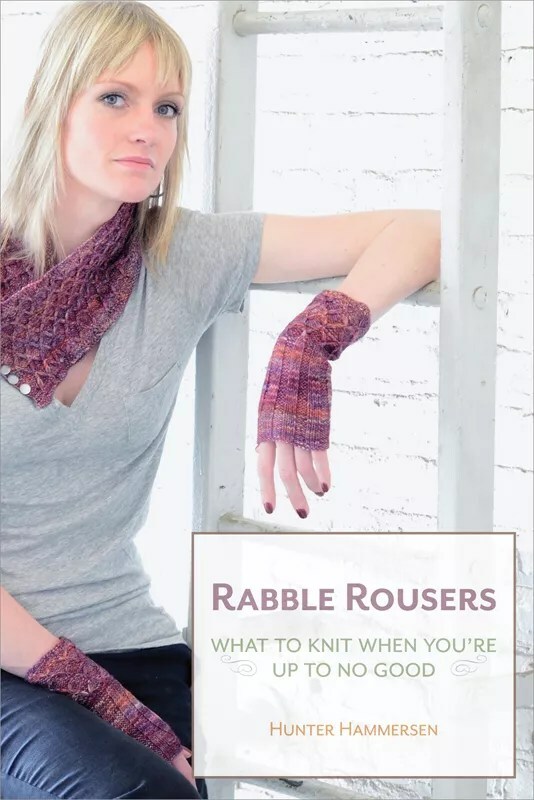 Beyond the The Knitter’s Curiosity Cabinet, Hunter has another ebook, Rabble Rousers! It is a mini collection of what to knit when you are up to no good! You can see the patterns here, or on Ravelry! This podcast is sponsored by: Knitter’s Magazine, Craftsy.com, Kollage Yarns, Fiesta Yarns, and Bijou Basin Ranch. Right now I am working on an eclectic collection of projects with sock yarn – a baby hat, a cardigan, a blanket, and yes, a pair of socks! Sock yarn…it’s not just for socks! Hats, shawls, cowls and mitts, even toys. My eclectic collection includes a knitted snake out of sock yarn! I have made a bunch of colorful doilies with sock yarn. Quite the eclectic collection. I like to use sock yarn for baby things – little hats, sweaters, booties, and even pieced baby blankets. The variegated colors and beautiful fibers of many sock yarns make some beautiful and eclectic collections for newborns! I have made decorations for my living room with sock yarn. Ive always wanted to give off an eclectic vibe. Great show as always Marly! Kudos to Hunter- self publishing is an impressive feat! Great show. Great interview. Got to check out the book, too. Add it to my eclectic book collection. I love to use my sock yarn for a lot of eclectic things like socks, shawls, hats, and mitts. I would love to see a copy of this book in person. Very exciting! I’m an indie dyer’s dream, as I can never resist a skein of beautifully hand-dyed sock yarn! As a result my stash has grown to ridiculous proportions (but I like to think it’s a yarn fondler’s paradise! ), and I aim for an eclectic collection of patterns to match. My first love is socks, of course, but shawls, scarves, mitts and even cardigans and blankets (that’s a heck of a lot of knitting) are also in the mix. Great podcast, as usual! I’m a relatively new knitter/crocheter and have been somewhat intimidated by sock yarn so far. I’ve only just gotten some size 2 dpns, so now I’m ready to take a sock journey. Maybe one day I’ll have an eclectic collection of handknit socks! I love sock yarn. There are so many ways you can use it. shawls, socks and more. I’ve acquired an eclectic stash in less than a year and would love to have Hunter’s patterns so I can use up some of it. I’ve only made one pair of socks, so far. It would be great to win this book to help me choose sock patterns and yarns from the eclectic mix of patterns and yarn that are available. Someday I’d like to make a shawl from sock yarn, as well. I liked hearing your interview with Hunter. I have both her books and like the way she is inspired by oriental rugs & eclectic botanical prints. Hearing her voice makes the patterns more meaningful. Thanks for your podcast. I love the eclectic patterns in Hunter’s book and I have many sock yarns that are waiting for their chance to become an eclectic pair of socks or a shawl or any number of accessories. HI THERE LUCKY! You are the winner of Hunter’s book! I just sent you an email so please be sure to reply back with your 411! Loved the interview & her point of view & eclectic pattern collection! I love using sock yarn for all sorts of projects, from fingerless mitts to sweaters & of course socks. I love using sock yarn for baby garments, small shawls and of course socks! My style isn’t very eclectic but I do know what I like. I love the eclectic mix of patterns in this collection! I have not used sock yarn for any project yet. I would love to have this eclectic collection of patterns so I can explore the options of using sock yarn for other projects. Love your show. Always miss the live show, but I just caught up with this recorded episode. Enjoy making small shawls with sock yarn. I find this eclectic style suits my wardrobe. :). I make plain socks for myself, but am always looking for patterned for gift socks. The patterns in Hunter’s book are perfect. This is actually the first Podcast I have listened to, but IT WILL NOT BE MY LAST! Great listening at work, I am currently using Sock Yarn for a Beanie Hat and also a Baby Beanie. I have never actually knitted socks before, but it is my next project since my beanie hat is my first circular knitting attempt. This Podcast was amazing. I have been looking for Knitting/Crotcheting centered radio to listen to at work, and I have found just that. I was particularly inspired by her story of how she picked up and put down knitting before her permanent commitment. Like listening to my own story. Love the traveling stitches. Something I must add to my vocabulary!